Happy Tuesday! I have missed being here on the blog, but these last several days were so busy. I made a lot of design team cards in advance, did major work in the front yard, went to dinner with the family, took a yoga class, buried a dead baby bunny found in the garden (made me SO sad), took Cristabel to the vet. Those butterflies aren't real; they are paper and available from Blumchen & Co. HERE. You get 18 butterflies for $2.00. SO cheap! I, however, love to make my own. These are from Lost Coast Designs' Butterflies set. 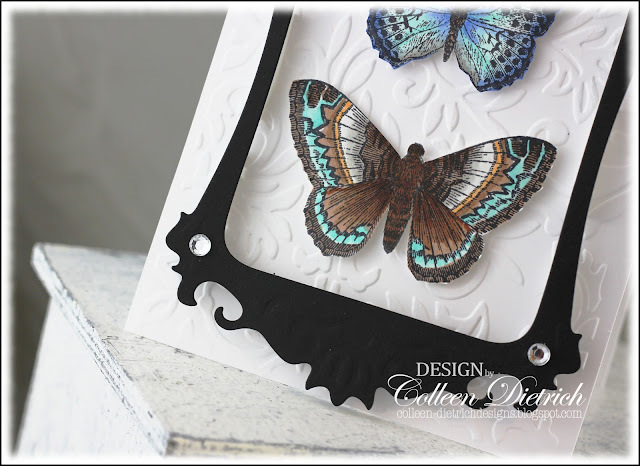 Runway Inspired - (photo above) - I was inspired by the way the light in the background creates a 'frame', with texture on the white portions (so I embossed my card base); also, if you enlarge that photo, you can see beautiful design and color like a butterfly's. Okay, so now the part about the "good bye". I've been with Blockheads Paper Arts since December 2011, but my term has come to an end. Owner Stacey Dunning has been so generous and kind, laid-back and encouraging. Thank you for letting me be part of your team, Stacey! I enjoyed every moment. What a seriously gorgeous card! I am in LOVE with those butterflies! Oh my goodness....someone might be shopping today haha. Love those framed butterfly's, so beautiful! Beautiful butterfly card! Great inspiration photos. We, The Blockheads, will miss you dear Colleen! Your fun attitude and gorgeous projects have been such a treasure. Stay in touch! Colleen, this is one of my favorite cards that you have done. And I have a lot of favorites! The butterflies are colored beautifully and the embossed background is the perfect resting place. This is just stunning....that company has some AWESOME stuff! They look real! This is so pretty Colleen! Amazing. Another really gorgeous card, Colleen! I'll miss you at Blockheads, you are such a sweet person, and it was great being on the dt with you! But you know I'll still be visiting--you can't get rid of me that easily! Beautiful, Colleen! I love how you translated the inspiration pieces into your card! Oh, Colleen, this is absolutely beautiful! I love butterflies too and yours are so realistic! I am going to miss you too, and look forward to visiting your blog from time to time to see what you're up to! Good luck in all your crafting endeavors! I've enjoyed getting to know you and being on the Blockheads DT with you! Absolutely stunning, Col! LOVE that bold, black frame against your bright, white, embossed background! And those butterflies are fabulous! I know you will be deeply missed! Amazing card Colleen!! Love the butterflies! Congrats on the Splitcoast shout out!! Your card looks wonderful. I just love your spin on the inspirational photo. Love those butterflies..
Those butterflies look like they could fly off the card - so realistic! Or, stick a pin in them and we would think they were alive but now dead specimens! What I am babbling about is that your coloring is fantastic - so cool! I swear the bodies look almost like a real butterfly with sort of a fuzzy texture. No silly, not drinking anything stronger than a Diet Coke! Love the black border thingy too. Great job as always! Hugs to the kitty for me since I am allergic to cats. That's stunning! Your colors and coloring are beautiful. Love the way you framed those beautifully colored butterflies. Thanks for sharing with us at FTTC. Gorgeous card, Colleen. Perfect use of the inspiration! You have me curious about the trick for the vet visit now. Ok - I am going to start tearing out pages from magazines and making cards too - that is so fun!! Beautiful card - pretty 'flies and great details as usual. Sounds like your life is very full and full of the right stuff. Many hugz to you my friend!!! Wish you lots of fun in your new endeavors. And your uber-gorgeous thank you card arrived in my mailbox today. You are so sweet. Those butterflies are so pretty with their shimmer. Didn't you love that TT? Oh, do those butterflies ever pop!!! Love them and the pretty frame just makes them the center of attention. Beautiful for Mother's Day. Blockheads will miss you. I have enjoyed the beautiful cards you made for them. Sure hope your Cristabel is going to be fine. I know 'MOM' is worried. That's SHARP! Wow, great punch to this one! Hope you are well. I'm in my new house and the craft room is together. Now I need to get my creative hat back on...which is hard, I keep thinking of things to do to the house. Loving your blog, always some pretty clever stuff. Take care, chat again soon. Hi Colleen! I can identify with the being away from the blog bit. I've been immersed in design team work these past few days, too. And yesterday I went for a haircut--it's pretty dramatic! Everyone seems to like it, though :). Every time I pick up Country Living in the kids' orthodontist's office, I always find TONS of inspiration! I saw that page from CL, too, and *wished* I could have ripped it out myself! I think I'm going to have to add CL to my subscription list next fall when my daughter's school does its magazine sales fundraiser. I've been loving it! And speaking of loving, I ADORE this pretty card! Those butterflies are magnificent. You were clearly inspired by that fantastic faux butterfly collection in CL! Way to end your Blockheads term on a high note! Stunning job with these butterflies Colleen! I love the colors and you did a gorgeous job coloring them! Thank you for playing along with us in Flourishes Timeless Tuesday! Very very elegant! It need to be in a shadow box. The colors and the embossing are perfect for you cut out! 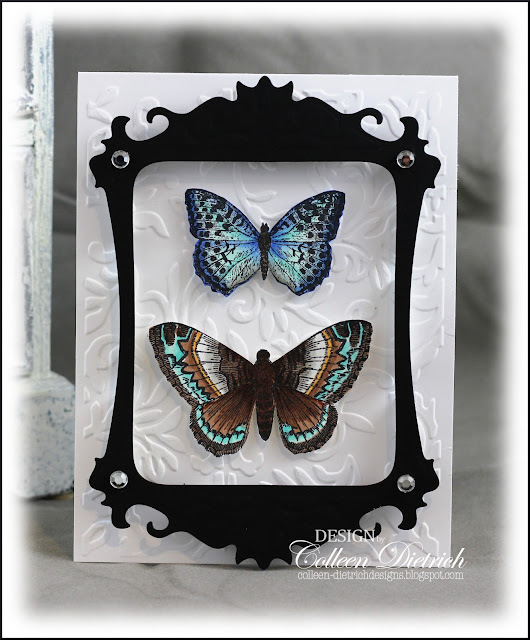 Love those delicate butterflies framed out by the ornate black design. Thanks for playing with the Runway Inspired Challenge! Wow, this is just stunning! Your butterflies are gorgeous! I'm your new follower! OMG Colleen! Your butterflies are breathtakingly beautiful! Perfectly colored; the top one has a translucent quality to it. I love how you framed them on the embossed bg. Those butterflies are gorgeous! 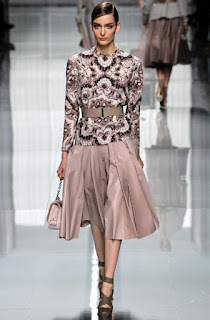 And I really like the way you used the framing of the runway look to inspire your card. Thanks for playing along with us! I love how you interpret with the inspirations photo, great card! Thanks for joining us at Runway Inspired Challenge! WOW Those butterflies are just gorgeous! Beautiful card! I only came across that CL magazine at my arlington dental clinic as well and since then my perception of the wild life has changed for the better. I'm a Merry Monday Featured Designer!